The beginner level animal psychic courses work well for people interested in animal communication. These courses the starting point for people who want to learn to communicate with animal intuitively for fun of it and for people who are thinking creating a business as an animal psychic. There are no prerequisites for the first course so everyone is welcome! In this 6-week video course, Animal Psychic Danielle MacKinnon shows you how to merge your innate intuition (even if you aren’t yet aware of it) with that of the animal to experience a depth of connection like never before. You’ll learn the 3D and Soul levels of connection as well as the deeper level. If you want to learn from your living room, but also want live support, information, guidance and assistance this is the class for you. 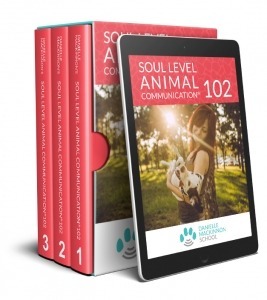 In this advanced 6-week video course, Danielle MacKinnon teaches you how to take your skills to the next level so you can communicate with animals with more confidence and with more tools in hand to handle more complicated situations. If you prefer to learn to be an animal psychic at your own pace, in the privacy of your living room, this course is just for you! 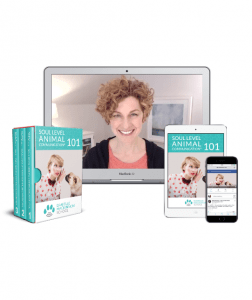 In this advanced 6-week live video webinar course, Danielle MacKinnon shows you how to take your animal psychic skills to the next level so you can communicate with animals with more confidence and with more tools in hand to handle more complicated situations. Grow with your fellow students as you increase your pet psychic skills! This class was created for those who want to continue their animal psychic journey. The class focuses on learning to manage sessions, handle any challenge presented by the person or the animal in a reading, and continuing to grow confidence. Learn more about your options in this class for the Beginner and Certification levels.